Hank's Plumbing has a team of technicians who service commercial and residential buildings for plumbing, HVAC, and gas fitting. The growing company needed to replace a manual paper system for work order management that was causing delays and inefficiencies. They implemented Flowfinity to manage dispatch, invoicing and inventory, and make building information available on technicians' smartphones. Michael Edworthy, Operations Manager, explains why Hank's Plumbing selected Flowfinity and how the new system has impacted their business. "Between management, administrators and the technicians we're saving at least 19 hours per week on average." What was the overall need that prompted you to seek out Flowfinity? All of the processes relating to our service cycle were completely manual and paper-based, and they were all very time consuming. Work orders, dispatch, and invoicing were all done through paper and phone calls. We were facing the issue of having to interpret handwritten paper forms, and paperwork was taking more of our field technicians' time than we wanted. Inventory was also time-consuming to manage with a manual system. We did a manual count every couple of months, and we didn't always know which parts we had in our vans. We were growing, but it was difficult because we couldn't handle that growth. We considered several solutions, but liked Flowfinity's personal approach. What are you using Flowfinity for now? We use Flowfinity for all aspects of work order management: dispatch, invoicing, job costing, and parts inventory. We maintain records within the Flowfinity database such as client information and customer referrals. We also use it to track specific details about buildings, so that they are available for every technician to see. How has the software helped with regard to maintaining building records? Before, we had to do a lot of phoning around to figure out who knew what about which building. It was inefficient, and I'm sure it affected our customer satisfaction not having that information at our fingertips. Now if we have something going on at a particular building, it doesn't matter which technician gets dispatched. If there is something unique about that building, say in the mechanical room, the technician can pull up the building comment form that we've built with Flowfinity, and they can find out where to go and where things are located. What were some of the invoicing challenges you faced? Field technicians would have to spend time looking up specific labor rates and discount rates for each customer, which was time consuming. Handwritten invoices had to be interpreted which was difficult, and time had to be spent entering the data into the computer. Using paper forms also meant that there were opportunities for missing invoices. For example, if a technician misplaced an invoice or forgot to charge for a certain part, it couldn't be easily tracked, so it could go lost and we would miss that revenue. How does invoicing work today? Invoicing is all automated now within Flowfinity, and is completed on field technicians' smartphones. When a technician updates a call and marks it complete, the Flowfinity application creates the invoice, converts it to a PDF file and emails it to the technician's mobile device, all within a few seconds. Our field technicians can then look at an invoice right away to see if it looks right or if they missed anything. If needed, they can reopen a ticket, make changes, and then resubmit it for a new invoice. This is great because it doesn't require an admin person to do it. What changes have you made to your job costing process? Before, when they would complete a job field technicians would have to figure out what the rate was for each client and part. Sometimes it could take them up to a week to gather that information so that the job could get billed. Now that everything is built into Flowfinity, our job costing happens on the same day. Our technicians no longer have to think about a specific labor rate for a specific customer, or whether they get a discount or what that discount is. Now all they have to do is add the parts used and the number of hours of labor, and the app calculates everything automatically. What I like about Flowfinity is how customizable it is. If we have a new customer tomorrow that we want to offer a different pricing structure to, I can add the labor rates and discount levels within about 10 seconds. It's quite dynamic. Can you describe your new dispatch system? Dispatch is all handled within Flowfinity now. If it's an emergency, someone in our call center can open a call in Flowfinity, create a work order, and dispatch it out right away. 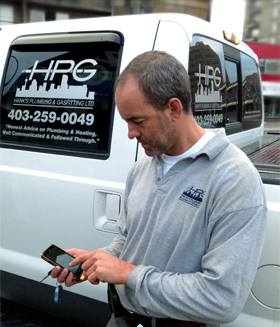 Dispatched work orders are then are sent as notifications to the technician's iPhone. If we are dispatching for some time in the future, we log calls in a spreadsheet. At the end of each day they are uploaded through a CSV file into Flowfinity, and the software creates all the calls and dispatches them out in a batch. I really like the fact that I have the option to upload calls through a CSV file, so I don't have to enter them one at a time. "Dispatch is all handled within Flowfinity now. If it's an emergency, someone in our call center can open a call in Flowfinity, create a work order, and dispatch it out right away." Have you achieved time savings in the office as well as the field? Between management, administrators and the technicians we're saving at least 19 hours per week on average. For example, I used to meet with our plumbers twice a week to collect their paperwork. I don't do that anymore, which gives me extra time in the week that I can use to manage and grow the business. And it gives our plumbers extra time to contribute to billable activities. Have your customer response times changed? I would say that they have improved substantially. With all things being equal, we can dispatch a call and a customer can get a response time within two hours, if required. Before Flowfinity with all the manual processes, if we got there the same day that would be great. We are much more efficient now with Flowfinity, so we can handle more activity in a day, and it's also more accurate. Now I know that we can complete the work, close calls, and complete each invoice quickly, allowing us to complete more calls and respond to new calls faster. What changes have you made to your inventory system? Previously, tracking inventory was quite a manual process. Every couple of months we would do an inventory count to find out which parts we had in our vans, which would take all day. Now we maintain a list of inventory in Flowfinity, which has allowed us to save several hours on our inventory count. If we need to change pricing on any of our parts we can do it easily, and we can ensure that a price on a part is correct no matter who consumes it. This was difficult to keep track of before because our customers have different discounts for materials. There are some parts that we do not discount, and we can now easily flag whether those parts are discountable or not. It's all in the system, so that we don't have to guess what to charge for a part. Would you say that Flowfinity given you a competitive advantage? Absolutely. In any presentation to a new customer we mention that we use Flowfinity and how it helps us to be more efficient and productive. I think our customers are looking for companies that are growing and utilizing technology to deliver better, quicker service. How has Flowfinity impacted your business overall? I know for a fact that we're completing more calls and we're billing more. Now we can track every service event and make sure that we can charge for it, something we couldn't do very easily before. This is important to us because it's a time and materials business and we charge for everything that we do. Our revenues are up 25%, profits are up, and we're doing more activity and closing more calls now. Flowfinity is so scalable, it keeps us organized, and it really allows us to grow. Overall Flowfinity has been a perfect fit for us.